Cross Moceri and Peter Cipriano launched their potato chips manufacturing company in 1930 and called it Cross and Peters. As the aim was to make a better potato chip, the brand name Better Made Potato Chips was adopted. Better Made became not only a brand name but a way of doing business. Even in the early days of the company, only the best potato chips ingredients and methods were used. At first, production was simple. Burlap bagged select potatoes were cooked in the best oil available, weighed, and hand packed into crude grease free bags. Distribution was chiefly through the company's own store outlets which later grew into small delivery routes. Today, Better Made uses 60 million pounds of chip potatoes every year and the entire process is a little more complex than the original kettle cooked chips processes. Hydraulic lifts transfer the potatoes from trucks. The potatoes are then transported by conveyors to storage bins. The potatoes are then automatically conveyed to the fryers where they are washed, peeled, sliced, and inspected. Next, the potato slices are conveyed to high temperature controlled cookers where only 100% cottonseed oil is used. The cooked chips are then lightly salted and automatically advanced by an overhead vibrating conveyor system to automatic packaging machines that weigh, form, fill, and seal the finished potato chip bags. Better Made Potato Chips uses all natural resources and are untouched by human hands from the time the potatoes leave the farm until you bring the crunchy chips to your mouth. 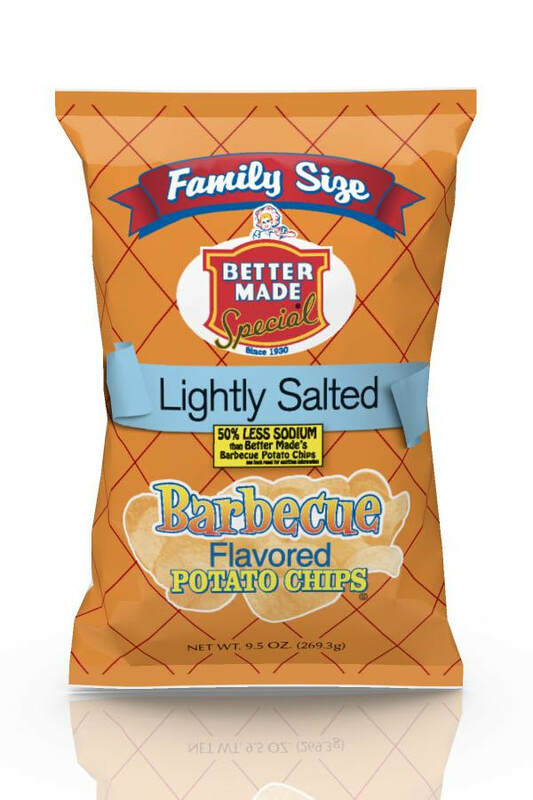 Onion, Salt and Vinegar, and Sweet Bar-B-Q, plus healthy chips and healthy alternatives to chips, gourmet chips and snack foods, you have the best snacks for any occasion. Should you drive by the Better Made Snack Foods factory on Gratiot Avenue in Detroit on a weekday, roll down the window a bit. There’s not much to look at. The scene is a typical Detroit neighborhood, a slumbering main drag leading to side streets with a few tidy homes amid derelict vacants. But you’ll find one overwhelming difference here: This neighborhood smells like potatoes.